Steph Jordan Artist: WELCOME "WHERE BLOGGERS CREATE" PARTY HOPPERS! WELCOME "WHERE BLOGGERS CREATE" PARTY HOPPERS! COME ON IN, THIS PARTY STOP IS OFFICIALLY OPEN!!! Here are a few pictures of my slice of Artistic Heaven. 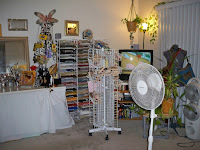 To the left is 2 Four Foot table that have been covered with Vintage Linen which hides 2 large three drawer units where I store my product like powers, paints, etc. Since I've spent the past few years setting up at various Fairs and Shows I've collected lots of Displays. I've decided that climbing up and and down the stairs with this stuff is no longer an option :-) so it came in handy for setting up my studio. My studio is actually set up in my 700something square foot apartment in the East Bay, California. The Studio and Living Room share a space so it was necessary to make this work space comfortable and functional. The Red Futon folds down for guest but also had great storage space underneath and behind. 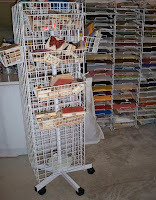 Smaller revolving racks are used for products like Alcohol Inks and Glimmermist. I also used other display items to hold and store Art and Product. Thank you so so much for stopping by.